When should one seriously consider a wrist joint denervation (severance of the pain nerves)? What other therapeutic measures are there in addition to the aforementioned wrist wrap to address pains in the wrist joint? Are there any naturopathic options when faced with the diagnose wrist osteoarthritis? What exactly happens during a denervation of the wrist? Is this an outpatient procedure or does it require the hospitalization of the patient? Is it possible to predict the outcome of a denervation of a wrist? What are the chances for a wrist joint denervation to turn out as expected? The image shows a wrist wrap as it is used frequently by patients with wrist pains (e.g. osteoarthritis). Wearing a wrist wrap too frequently may lead to considerable mobility limitations of the wrist. Many people suffering from osteoarthritis use pain killers such as Voltaren®, Ibuprofen®, Arcoxia® and similar anti-rheumatic agents. The problem with all non-steroidal anti-rheumatics is the frequent side-effects such as gastric hemorrhaging as well as many more. Particularly if these drugs are being taken frequently or even on a regular basis, a denervation procedure represents a very valuable alternative! One option which should be mentioned in connection with wrist (as well as knee) osteoarthritis is leech therapy. Prior to committing to surgery all less strenuous or risky options should always be considered in my opinion. 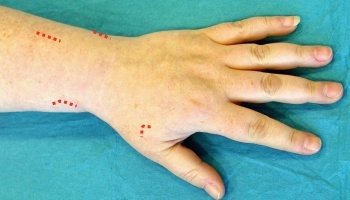 Markings associated with the surgical cut in connection with a denervation of the wrist. First, several smaller incisions are applied to the wrist joint. The image shows a typical surgical cut as used for a wrist joint denervation. Several minor incisions are also applied to the palm side of the wrist. Please note that the surgical cut may slightly deviate from the illustration shown here, depending on the location of the pain in the wrist. The hand surgeon will now identify the incision points according to Wilhelm in order to interrupt the relevant nerve fibers. It should be pointed out that a denervation will neither impact the wrist function, nor will it hurt the sensory nerves responsible for the hand, skin and fingers as long as the procedure is carried out properly. This really depends on the individual needs of the patient. Hospitalization, however, only rarely becomes necessary (for example if other serious complications need to be addressed). There have been a variety of attempts to come up with forecasts on wrist joint denervations based on so called “trial nerve blocks”. In theory by injecting a local anesthetic agent close to the pain nerve of the wrist which is responsible for the pain, the resulting nerve block will serve as indicator as to whether a denervation would be successful or not. If the patient experiences a much reduced pain level for one or two hours after the nerve block, it may be assumed that the denervation would lead to the desired outcome. Unfortunately this fascinating procedure does not work quite as well in real life as it would sound in theory. Therefore a number of hand surgeons no longer adheres to the procedure recommended by Wilhelm which implies a trial injection as it has not proven to be sufficiently reliable. As a patient you should know that there is a sixty percent chance of reducing or even eliminating pain discomfort through a wrist joint denervation. The pain reduction most likely will be undone later on due to a progressing osteoarthritis. However, the advantage of a wrist joint denervation lays in the fact that you will retain mobility of the wrist for years to come and that the intervention is much less strenuous than an arthrodesis.